1. What is full text? Accessing Full-Text Articles: 1. What is full text? The "full-text" of an article is an entire article, not just a snippet or summary. Identifying the full-text isn't always straightforward. For example, the following two resources are both very short in length. However, the first one is a full-text article, while the second example is an abstract, or summary, of a full-text article. Be aware of the type of source that you are reading. From: Forfert, Nadège, et al. 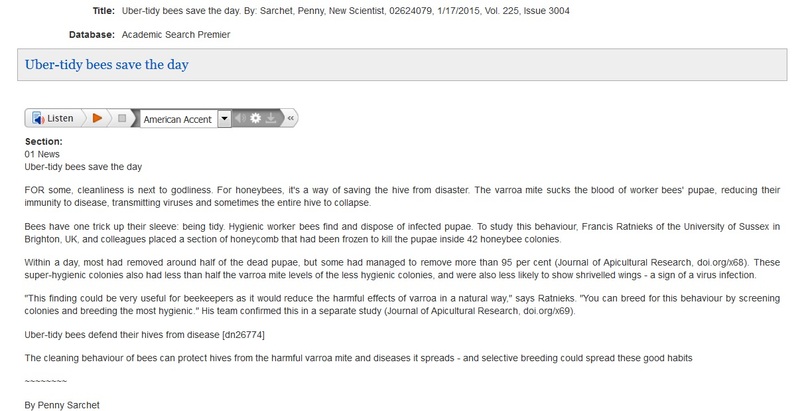 "Parasites And Pathogens Of The Honeybee (Apis Mellifera) And Their Influence On Inter-Colonial Transmission." Plos ONE 10.10 (2015): 1-14. Academic Search Premier. Web. 16 Nov. 2015.